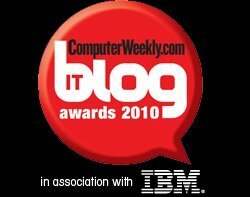 IT Blog Awards 2010: Software Development - category information. One of the new categories for 2010, developers are among the most active online community of IT experts and there are plenty of great blogs about application development, tools, methodologies and topics such as open source. Here we're looking for the best in this huge field. Get your badge now. quality="high" bgcolor="#ffffff" width="120" height="220" name="cw_badge10_softwaredev" align="middle"